The record-keeping capability of ZEI 2257 allows you to maintain comprehensive records while adhering to strict record-keeping requirements in accordance with 18 U.S.C. Section 2257 and 28 C.F.R. Part 75 regulations. Through intelligent system design, ZEI 2257 separates your records into logical classifications which simplifies management and ensures only relevant information is presented during federal record-keeping inspections. The unified interface of the Performers Details window allows you to view and maintain information with ease. Performer records are comprised of compulsory information such as: Legal Name, Maiden Name, and Date of Birth. Additionally, each record contains an optional photo for easy visual recognition and includes a list of all appearances by the performer for related content titles. Access and examine all relevant content data from a single screen, without the distraction of unneeded information. 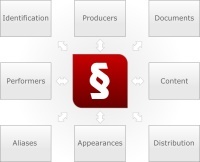 Content records consist of details regarding the title, producer, date of creation and the performers that appear in the depiction. Records can be categorized and associated with keywords to allow even greater flexibility in locating information. Record Driver's Licenses, Passports, Photo ID cards and other forms of identification presented by the performer. Log Aliases, Nicknames, Stage Names and Professional Names used by the performer. Archive Release Forms, Affidavits, Agreements, Data Intake forms and more. Rapidly associate performers, identification and other supporting documents used in the creation of the content. Maintain and track content usage by website URLs, publications, broadcasts, retail products and more. Easily capture image sets and video clips to build comprehensive catalogs. 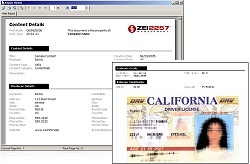 ZEI 2257 features both management and compliancy reports, which can be printed or exported to popular file formats such as Adobe PDF, Microsoft Word and Excel. All pertinent records are stored in a relational manner, enabling you to cross-reference, associate and retrieve information from any perspective. Effortlessly capture image sets and video clips to build comprehensive visual depiction libraries that are automatically associated to your content records. Ensure the integrity of your vital data by automatically maintaining a history of record revisions that detail what changes have been made and by who made them. Special tracking information is embedded during the cataloging process which allows you to retrieve content and performer details directly from the image.